Posted by santos. This entry was posted on 20050126 at 3:57 PM You can skip to the end and leave a response. Ummm. This looks interesting. I've never been too keen on peanut butter mochi for some reason even though I like peanut butter and I've never been a fan of the peanut butter/banana combination either. That said, chocolate mochi is usually very good. I wonder what happened here. Did you mix the chocolate with the mochi flour and then roll it in chocolate powder? 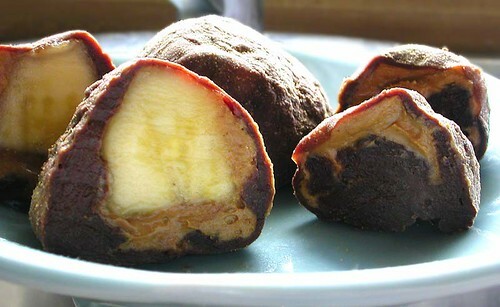 If you want, I can share a pretty good recipe for local style chocolate mochi that I have. It's not the same as what you made. In fact, it's more like what we call butter mochi. i reread the article, and maybe i have to mix in anko or layer it with koshian. i don't know. i think it's too rich for a giant chunk, small bites would be better. the chocolate mochi was ono though, i would definitely do that again. i keep seeing this recipe for chocolate mochi cake on the web--the one that begins 9 cups of mochi flour....? :-D please tell me yours is smaller! i haven't had butter mochi, but the way people describe it makes me think that it's texture is similar to the filipino cassava cake--sort of cakey but dense. oh yeah, i mixed the chocolate with the mochi powder, but i rolled it in the kinako instead. i have no problem with the chocolate mochi except i could probably finish a whole batch of it. hey great site, your pictures and descriptions made my mouth water! yummy! Hi Santos, have you ever made daifuku with rice cakes instead of rice flour? I'm looking for a good recipe using rice cakes and steamers instead of flour and microwave. hi jonny--are you talking about the dried mochi cakes? we only get the ones from japan here, so there aren't any english instructions. the only pictorial directions are for a toaster oven and frying. i did try steaming some last night (3 minutes in the rice cooker for the first, 5 for the second) and it seems the longer its steamed the softer it gets. i can't see why you can't just use that as the mochi wrapper--it's not as sweet, but that seems okay to me. just pound it a bit to get it to a softer consistency. i did try incorporating a 1/2 tsp of sugar into one of the mochi balls and it seemed to work fine--no grittiness, but there was a sugary shine. i added a little bit of anko and it tasted the same, only it was chewier than if it was made from the mochi flour. however, much easier. lynn, who did a mame daifuku for imbb, added beans and served them warm. so, so, good when it's warm.